It is with great sadness that we mourn the loss of our dear friend and former colleague, Ava Dorman. Ava was one of God’s most faithful children and it showed in every aspect of her life. While she was a member of Williamsburg Memorial Park, she comforted hundreds of grieving families and represented our park with tremendous professionalism. She was one of the most honest, caring, and dedicated people we have ever known and she was loved by everyone who was fortunate enough to have known her. Click here to learn more about Ava and her wonderful life. I remember the day I met Ava. I was looking for a family services counselor and after spending some time with her, I knew she would be perfect. She had a personality that would light up a room and a smile that was truly infectious. Ava had a wonderful sense of humor and was funny even when she wasn’t trying to be. She was also a diehard Baltimore Raven’s fan and enjoyed bowling with her friends and family. 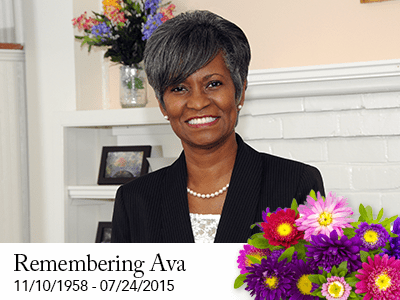 Ava’s services will be held on Saturday, August 1st at 10:30 AM at New Zion Baptist Church in Williamsburg, Virginia. Her committal services will be held at Williamsburg Memorial Park immediately thereafter. All ceremonies are open to the public. We are truly honored that Ava selected Williamsburg Memorial Park as her final resting place and we think it’s very fitting that she’ll be laid to rest here, alongside the many family members she helped throughout the years. Our thoughts and prayers are with Ava’s family and friends during this very sad time. We will miss you Ava.